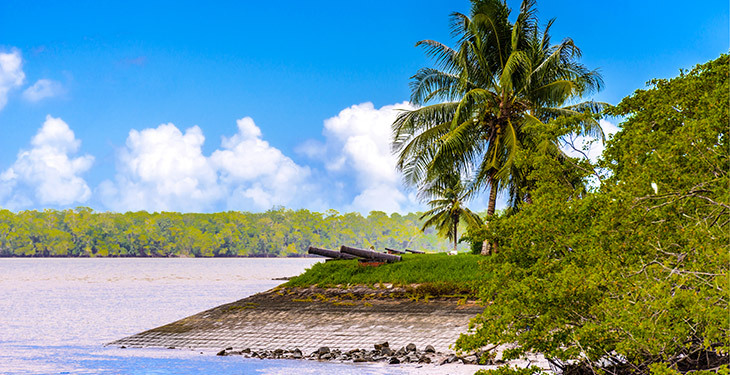 Experience the unique and diverse cultures of Suriname and Guyana on this unforgettable tour. Suriname and Guyana are neighboring countries on the Northern coast of South America and a melting pot of cultures from around the world. With a combined area of just over 126,000 square miles, together they are roughly the size of New Mexico but with half the population. You'll start your trip in Suriname, where you'll experience the rich Dutch heritage of the country. Visit the well preserved Fort Zeelandia and the quaint Dutch designed buildings in downtown Paramaribo. Absorb the exotic mix of Javanese and Hindustan cultures which are easily recognized in the city. Discover the maroon community of Santigron, where you'll have a snap shot of what life was like in Africa during the 17th and 18th centuries. These maroons are the descendants of slaves brought from Africa to work on the sugar plantations in Suriname from which they escaped. You'll then head to the capital city of Georgetown and experience the unique lifestyle of Guyana which is a fusion of various cultures: the Amerindian indigenous peoples, Africans who came to Guyana as slaves, European colonizers, and the Indians, Portuguese and Chinese who came as indentured servants. This wonderful mix is reflected throughout the culture, food and architecture of this unique country. You'll also visit the remote Kaieteur Falls. Five times the height of Nigeria Falls, Kaieteur Falls is the longest single drop waterfall in the world. Due to the low population and remote location, your small group may very well have the falls to yourselves. This adventure is perfect for anyone who loves nature, wildlife, hiking, and the outdoors, and is also a great way for English-speaking travelers to experience a new culture thanks to the lack of a language barrier. 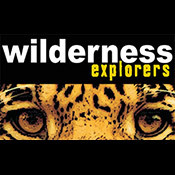 Wilderness Explorers offers a true small group experience away from the tourist crowds, amazing opportunities to view a stunning variety of wildlife unique to South America, and a friendly and exciting atmosphere, all in an unforgettably beautiful part of the world. Upon arrival at JA Pengal International Airport, you'll be met by a representative from Wilderness Explorers and transferred to the Eco Resort Inn. Your guides will pick you up around 9:00 am this morning and take you through the outskirts of the city, providing insight about the villages, countryside and other interesting sights along the way. Eventually you'll arrive at the village of Lelydorp, where you can visit the local market. Your journey continues to Santigron, a traditional Saramaccan Maroon village near the Saramacca River. Enjoy a walk through the village of about 1,750 inhabitants as your guide shares knowledge on the nature, history, and culture of the people and the village, and how the Maroon culture influences daily life. Along the way you'll meet villagers and see the local school, church and main square. Today you'll receive a guided tour of Paramaribo, the capital city of Suriname and a UNESCO World Heritage Site. Tour around the city by car and on foot along the most prominent historic locations around downtown. Your guide will provide extensive information about the former “Fort Zeelandia,” the Presidential Palace, Independence Square and many other monuments. These buildings are a true representation of the colonial history of Suriname and the architecture is truly a marvel to behold. You'll take a casual hike past the Waterkant, along the bank of the Suriname River and through the Palms Garden, where you can enjoy other interesting sights such as a mosque right next to a synagogue. Continue your tour in the Commewijne district, situated to the east of Paramaribo across the Suriname River. The tour will take you along the former colonial plantations, most of which are now abandoned. You'll take a pit-stop at Peperpot plantation, where the coffee and cocoa factory, deputy-director’s house and the old office are located. Peperpot was established by the English and had already existed before Suriname was conquered by the natives from Zeeland under the command of Abraham Crijnssen in 1667. This former plantation is one of the last plantations still in it's original state and one of the oldest sites of its kind. 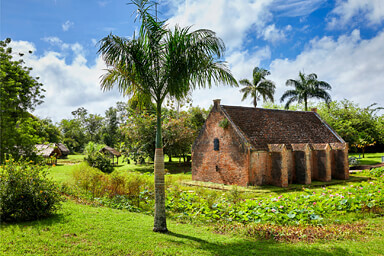 On the plantation you can still see coffee and cocoa plants as well as an ancient shed and factory, the manager’s residence and a kampong (workers’ living area). In addition to it's rich history, Peperpot is also renowned for the incredible number of birds that frequent the area. From Peperpot, you'll head to the mini-museum of Marienburg, a former sugar plantation, before enjoying a delicious lunch in a typical Javanese restaurant (warung) in Tamanredjo. You'll then continue to the confluence of the Commewijne and Suriname Rivers at Nieuw Amsterdam. Here you'll visit the outdoor museum of Fort Nieuw Amsterdam, a large fortress built as a defense for the crop fields that were situated along the upper parts of both rivers. Afterwards, you'll be transferred by car or bus to Paramaribo. Extras: Sunset Dolphin Tour; Dinner at a local Javanese restaurant "Mirosso"
Today you'll be picked up early from your hotel and transferred to the JA Pengal International airport for your flight on Surinam Airways. Arrive in Guyana about an hour later at Cheddi Jagan International Airport where you'll be transferred to the famous Cara Lodge in Georgetown. Cara Lodge was built in the 1840's and originally consisted of two houses. It has a long and romantic history and was the home of the first Lord Mayor of Georgetown. Over the years, the property has been visited by many dignitaries including King Edward VIII who stayed at the house in 1923. Other notable guests have included President Jimmy Carter, HRH Prince Charles, HRH Prince Andrew, Channing Tatum, and Mick Jagger. This magnificent wooden colonial home turned hotel offers the tradition and nostalgia of a bygone era, complete with service and comfort in a congenial family atmosphere. 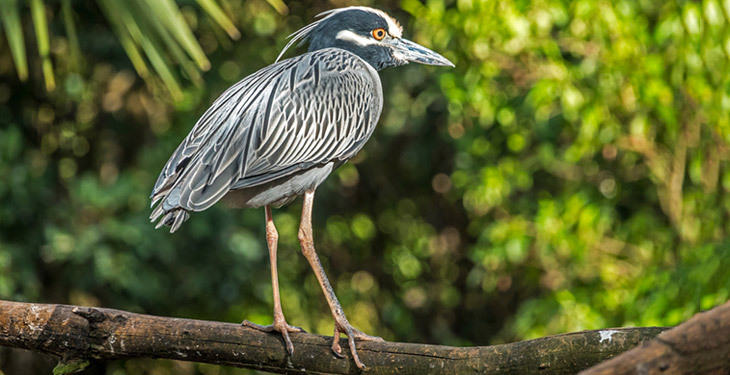 If you wish, you can sign up for an optional bird sighting tour early this morning at the Botanical Gardens (see FAQs for all optional activities and prices). If not, you'll be picked up at 11:30 am and transferred to Eugene F. Correia International Airport. You'll take a scheduled flight over the Demerara and Essequibo Rivers, as well as hundreds of miles of unbroken tropical rainforest to land at Kaieteur Falls, the world’s highest free-falling waterfall. Kaieteur, which was first seen by a European on April 29, 1870, is situated in the heart of Guyana on the Potaro River, a tributary of the Essequibo. The water of Kaieteur flows over a sandstone conglomerate tableland into a deep gorge - a drop of 741 feet; 5 times the height of Niagara Falls! Amerindian legend of the Patamona tribe has it that Kai, one of the tribe’s chiefs (after whom the falls is named), committed self-sacrifice by canoeing himself over the falls. It was believed this would encourage the Great Spirit Makonaima to save the tribe from being destroyed by the savage Caribishi. Kaieteur supports a unique micro environment with Tank Bromeliads, the largest in the world, in which the tiny Golden Frog spends its entire life. The lucky visitor may also see the famous flights of the Kaieteur Swifts or Makonaima Birds which nest under the vast shelf of rock carved over millions of years by the black water of the Potaro River. Following your adventure to the falls you'll be taken back to Eugene F. Correia International Airport and board a flight to Georgetown for another evening at the Cara Lodge. Before dawn you'll depart your hotel and travel eastward from Georgetown along the Atlantic coast to the Mahaica River. Here you'll be joined by your guide before continuing to the river landing. The narrow winding road to the landing runs parallel to the river and will take you through an area that has been mainly used for the cultivation of rice and other crops. This provides a glimpse into the everyday lives of the farming community scattered along the road. Fortunately, the area along the river has been well preserved and provides an excellent riverfront ecosystem inhabited by flocks of egrets, herons, ibis, various marsh tyrants, and Guyana’s national bird, the Hoatzin. Upon arrival at the river landing, you'll have a bathroom break and perhaps enjoy a cup of coffee or tea before heading out onto the river. This is the life-line of the community and is one of the main sources of transportation, food, recreation and fresh water to irrigate the fields. The river offers a rare chance to see the range-restricted Blood-colored Woodpecker, which has been badly affected by habitat loss in the Guianas coastal region. This woodpecker is only known to live along a narrow coastal strip that runs eastward for just a few hundred miles from Guyana. Along the way you'll also look for the poorly-known White-bellied and White-barred Piculet as well as the Spotted Tody-Flycatcher, Northern Scrub Flycatcher, and the threatened Great-Billed Seed Finch. This river is one of the best places to spot Guyana's national bird, the Hoatzin (Opisthocomus Hoatzin), also known as the Stinkbird, or “Canje Pheasant." This odd bird is an unusual species of tropical bird found in swamps, riverside forests and mangroves between the Amazon and the Orinoco delta in South America. It's a pheasant-sized bird about 25 inches long, with a long neck and small head. It is brown in color, with paler under parts and has a featherless blue face with maroon eyes, and its head is topped by a spiky, rufous crest. The Hoatzin is herbivorous, eating leaves and fruit, and has an unusual digestive system with an enlarged crop which functions as a rumen. It also produces a horrible smell to scare away potential predators. After birding you'll return to the home of your boatman, Ramesh. This is situated on the bank of the river and where you'll have breakfast before returning to Georgetown. The drive back to Georgetown offers excellent spotting opportunities. 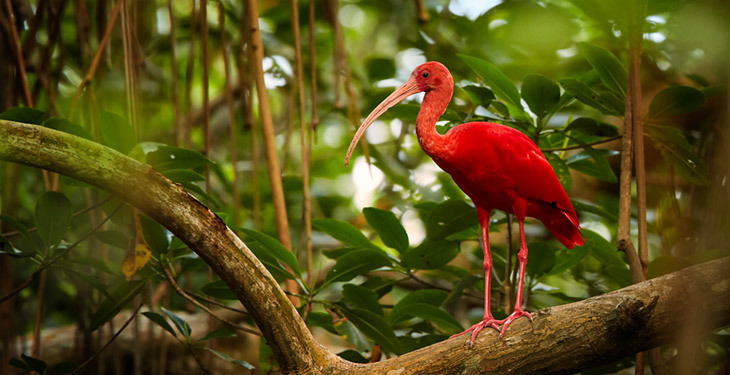 Some species include the Scarlet Ibis, Black Skimmer, Brown Pelican, Magnificent Frigate bird, Black-crowned and Yellow-crowned Night-herons, Little Blue Herons, Cattle and Snowy Egrets, Snail Kites and the Rufous Crab Hawk. This species is listed as near threatened due to the severe deforestation of its mangrove habitat both by nature and commercial development. For over 25 years, Wilderness Explorers, has been working at the crossroads of adventure travel and community tourism. Not from the sidelines or behind a desk, but on the ground, in the jungle and on the boats, getting their feet dirty and seeing everything first-hand. Tourism isn’t just their business – it’s their life and their handcrafted itineraries prove it. Back in 1999, Wilderness Explorers Guyana was one of the first tour companies to embrace the now-fashionable idea of community tourism, partnering with the Amerindian Makushi village of Surama in Guyana to provide marketing and administrative support for the country’s first indigenously owned and operated eco-lodge. Today, they continue to work with lodges and regional consortiums with tourism development aspirations. Their specialist guides cover a wide range of interests including environmental biology, birding, and even botany. They are eager to meet you and show you the best of their country. Once you've purchased your voucher on LeftLane Sports, contact the operator directly to check availability and finalize your reservation. Voucher valid only for travel dates that fall within start and end dates shown above. Reservations are subject to availability. Please do not make travel arrangements until you receive confirmation from the operator. Departures are based on the availability of rooms at the lodges and require a minimum of 2 people to operate. Please wait to make travel arrangements until you receive confirmation from Wilderness Explorers. What is the best way to get to the trip start location in Suriname? There is a direct Surinam Airways flight from Miami International Airport to Paramaribo, Suriname. Once you arrive, a tour representative will meet you at the airport and take you to your hotel accommodations. You'll be staying at two different lodgings during the tour: Cara Lodge in Georgetown and the Eco Resort Inn in Suriname. Formerly a statuesque townhouse, the Eco Resort Inn has been lovingly renovated while maintaining the authenticity of its exquisite colonial architecture. It has been transformed into the most charming lobby of one of Paramaribo’s more favored hotels, with numerous eco-friendly features. Located within a 5-minute walk of the historic center of Paramaribo, the rooms offer either a breathtaking view of the Suriname River or a lovely nearby garden. The hotel is ideal for guests who want to visit Suriname to relax and unwind. (Check in time 5:00pm, Check out time 1:00pm). Single supplements are available and are $438 per person. 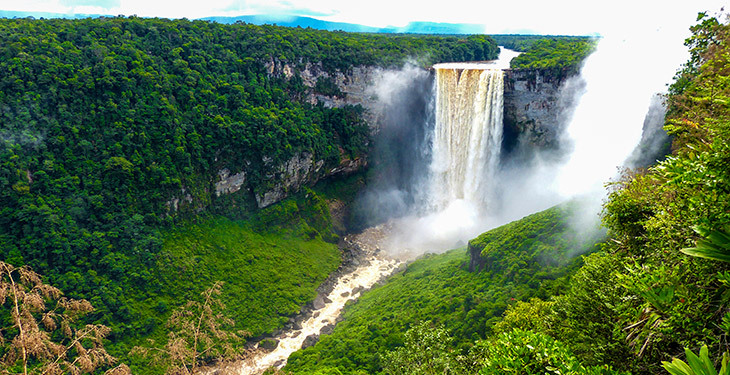 Guyana and Suriname have a warm, tropical climate with high rainfall. Average shade temperature is 80°F/ 27°C. The average high is 88°F / 31°C and the average low is 75° / 24°C. The heat is greatly tempered by cooling breezes from the sea. There are two wet seasons in the north of the country, from May to June, and from December to January. The south and the Rupununi region receive one wet season from May to July. All wet seasons may extend into months on either side. Rainfall averages 90 inches / 2,300 mm a year in Georgetown. Breakfast will be provided each day except for day 1 and day 8. Lunch will be provided on days 2, 3, and 5. Dinner will be provided on day 3. Suriname is famous for their Javanese and Hindustan cuisine. There are many restaurants, bars and cafes which offer international cuisine as well. In Georgetown, you can choose from a menu which includes local creole and international cuisine. Special diets can be accommodated, but please inform Wilderness Explorers in advance so that appropriate food can be supplied. The water from the tap is often brownish in color, which comes from plant tannins in the water, and not polluted. Most of the lodges have filtered water on site which is perfectly safe for consumption. Guests are urged to take along a refillable bottle which they can use at the lodges and on tours to reduce the use of single use plastic. Remember to drink plenty of water to prevent dehydration. Bottled water is also readily available and normally a complimentary bottle or two is offered at the lodges and any additional bottles cost extra. In Georgetown and Suriname credit cards can be used in most places except in local markets or small stalls on the streets. In the interior credit cards cannot be used, but there is little to buy. Alcoholic drinks are not included and beers are about $3 USD. Local currency is complicated as it is two hundred to one US dollar. US dollars are accepted everywhere and for tipping, smaller bills are better. A few hundred dollars in cash ($300-$400) should be fine for the duration of your trip. You'll be picked up at the pier in Leonsburg. While aboard, enjoy a drink, the cool breeze and the lovely river views while the captain searches the horizon for dolphins. You may expect to see them swim by in groups of up to 20. Curious by nature, the dolphins may even swim by the boat and leap over the waves to catch a glimpse of the passengers. Afterwards, visit a wonderful restored plantation where you can sample freshly made local snacks like barra, baka bana or eggrolls. Enjoy the snacks and beautiful sunset while in the old plantation village on a wooden deck near the waterfront of the Commewijne River. After the sun has set, you'll get back on board, pour another drink, and slowly make your way back to Leonsberg and your hotel. Transfer by vehicle for dinner at Mirosso, a stylish Indonesian restaurant. Take a drive through the heart of the city to the Stabroek Market area. Here you'll join the afternoon commuters using the old ferry stelling to board the river taxis which are used to cross the Demerara River. The river taxis are an alternative route to using the Demerara Harbor Bridge. 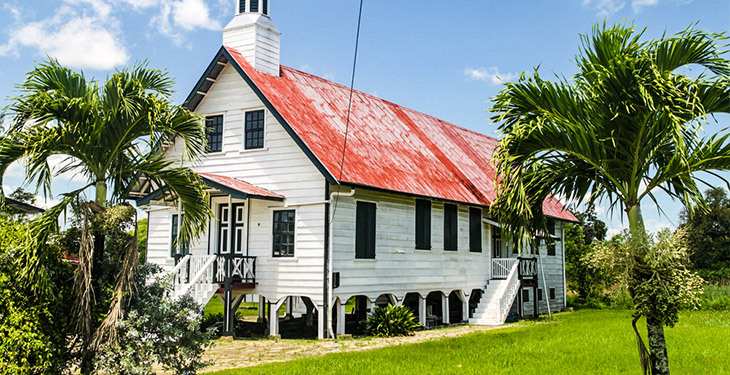 As you slowly cruise along the bank of the Demerara River, your guide will give you a brief history of the famous buildings along the waterfront. You'll then continue your trip to see the Demerara Harbor Bridge, once the longest floating bridge in the world at a total length of 6,072 feet long. It was commissioned on July 2, 1978 and was only designed to last for 10 years, yet it is still going strong. As the sun sets over the river you may witness flocks of brilliant Scarlet Ibis and Egrets as they fly across the sky and settle into the mangroves for the evening. You'll be picked up early this morning at 5:45 am and transported to the extensive and beautiful Georgetown Botanical Gardens where, if you're lucky, you might spot the Blood-colored Woodpecker. This astonishingly colorful Veniliornis is found only in the Guianas and, even there, almost wholly limited to the narrow coastal plain. The gardens host a variety of avian life, including Snail Kite, Gray Hawk, Pearl Kite, Carib Grackle, Red-bellied Macaw, Red-shouldered Macaw and more. You'll walk on trails in the back of the gardens and may see Yellow-chinned Spinetail, Black-crested Antshrike, Silver-beaked Tanager, Buff-breasted Wren, Golden-spangled Piculet and Ashy-headed Greenlet. You may even want to take a break from birding to feed some manatees in one of the nearby ponds. Following this excursion, you'll be transferred back to your hotel. Do you have additional information on traveling to Suriname? Attitude: To enjoy destinations like Suriname you need to come with the right attitude! This is a developing country and you'll be traveling in very remote areas, so expect things not to work like clockwork all the time. If things don’t work 100% of the time, just relax and go with the flow and enjoy the friendly, laid back atmosphere! That said, Wilderness Explorers does everything they can to ensure that everything works according to schedule, and 9 times out of 10 it does. If you hit the 10th time and have a delay or problem, then use the opportunity to do some birdwatching, have a rum, or relax in a hammock whilst your hosts rectify the situation. If issues arise: If you have any problems at all, from illness to displeasure with the service, Wilderness Explorers strongly suggests you talk with your hosts at each location. It will make your holiday so much more enjoyable if you can allow them to rectify any issues there and then, rather than being disappointed at the end of the trip, when it may be too late for them to solve the problem. Safety: Like any city, certain areas may not be particularly safe, especially after dark. Ask Hotel Reception or Ground Handlers (Wilderness Explorers representative) for guidance on these matters. In general you'll find Surinamese to be extremely friendly and helpful. Don’t be surprised if you find local people wishing to talk to you or offering assistance. At the Resort, it is secure and safe and you'll be able to completely relax without any concerns. Malaria regime: It is advisable to use an insect repellent and to wear long sleeves and long pants during forest hikes. Money concerns: The Resort accepts cash only, in Surinamese dollars (SRD), US dollars or Euros. Kindly ensure you have cash with you for souvenirs and extras. You can change money at your hotel, a bank or cambio. Exchange rates are adjusted regularly and rates vary from hotels to banks to cambios. The average rate for 2018 was $1 USD = $7 SRD. Cash and travelers checks can be exchanged in hotels, banks and cambios, though cambios normally offer the best exchange rate. Wilderness Explorers can assist in identifying the best cambios to use. ATMs: Holders of Cirrus cards can obtain cash from ATM machines in Paramaribo only. Internet: Surprisingly, you'll have internet access at the Resort. These remote locations use satellite internet for communications. Just ask at each location if they have internet and how to access it. Some places have a public computer for guests to use. But be mindful that there is limited bandwidth and you may be using what the locals need themselves. At times, due to lack of power or technical difficulties, the internet may not be available or be very slow. It is only to be used to send and check a quick email and not for downloading large files which will use up the very expensive bandwidth. Don’t be frustrated, it is a modern miracle they even have internet. Up until recently all communications were by letter or HF radio. Electricity/power: In Suriname, it is predominately 110 volts, though some areas also have 220 volts. Tipping: Tipping is not expected, but appreciated if you are happy with the service. As a guide, a 10% tip is adequate. Time Zone: Suriname is three hours behind GMT; four hours during UK Daylight Savings. Taxis: Taxis are painted yellow and most of them have meters. It is recommended that you use taxis from hotline numbers 1660 or 1680. If issues arise:If you have any problems at all, from illness to displeasure with the service, Wilderness Explorers strongly suggests you talk with your hosts at each location. It will make your holiday so much more enjoyable if you can allow them to rectify any issues there and then, rather than being disappointed at the end of the trip, when it may be too late for them to solve the problem. Money concerns:The local currency is the Guyanese dollar. There are notes for $20, $100, $500, $1000 and $5,000. Coins are for $1, $5 and $10. In the interior you'll need Guyana Dollars or US Dollars (small bills). You can change money at your hotel or, if your itinerary allows, your guide can arrange for you to visit a bank or cambio. The exchange rate is adjusted regularly and rates vary from hotels to banks to cambios. The average rate for 2019 is $1 USD = GY$200. Cash and travelers checks can be exchanged in hotels, banks and cambios and cambios normally offer the best exchange rate. Wilderness Explorers can assist in identifying the best cambios to use. Taxis: An "H" on the number plate identifies taxis and most taxis are also painted yellow. Taxis do not have meters, but have set fares for a route. A short trip around Georgetown should cost approximately $2 or $7.50 an hour and short drops are usually $2 to $2.50. It is recommended to have the hotel reception arrange a taxi from a reputable company.